Fourth Row Center: Film Writings by Jason Bailey: On DVD: "The Most Dangerous Man in America: Daniel Ellsberg and the Pentagon Papers"
The film, directed by Judith Ehrlich and Rick Goldsmith, runs on two tracks: as a personal biography of Ellsberg and a historical snapshot of what he did. The second part is easy, and part of the record: a former Pentagon insider, Ellsberg was a man transformed by the early 1970s. The once-hawk was now a dove, furious about the lies that the American government (particularly, five of its Presidents) had told the people about the circumstances leading up to our involvement in Vietnam. When his attempts to bring Congressional attention to a top-secret Pentagon study highlighting those lies failed, Ellsberg leaked the so-called "Pentagon Papers" to the New York Times, setting up a chain of events that pitted the Nixon administration against the free press, influenced public perception of the floundering Vietnam conflict, and led directly to the Watergate scandal that toppled the Nixon presidency. The details of that story, the whens and hows and whos, are riveting viewing. But you can find all of that in books and other documentaries. The juice here is Ellsberg's personal journey from one of the architects of the war to one of its staunchest enemies. Careful attention is paid to the details of his psychological make-up, to the doubts that were percolating in the late 1960s, to the concerns and fears that finally led him to conclude that "it wasn't that we were on the wrong side. We were the wrong side." Those are Ellsberg's own words; he both narrates the film and serves as its primary interview subject, a splitting of focus that requires a little getting used to. But that conceit does work, particularly when it leads to scenes like his powerful description of the moment when his life "split in two." Some of the picture's other devices don't play quite as well. The use of reenactments should always serve as a last-ditch, Hail Mary option for any documentary filmmaker who isn't Errol Morris; those scenes, and the cheeseball music and graphics of the opening sequence, give the film the unfortunate feel of a History Channel special (nothing against History Channel specials--I just don't want to pay good money to buy one on DVD). Some of the other, more inventive solutions to presenting scenes at which cameras weren't present (like the occasional use of simple animation) are more successful. There are other amateurish moments, but most are forgivable, particularly as the narrative tightens and picks up speed in the last 30 minutes. Those Nixon tapes continue to stun (was there ever a grown man who used profanity more awkwardly? ), and Ehrlich and Goldsmith do a first-rate job of conveying the real risks taken by both the Times and Ellsberg himself (he faced the possibility of 115 years in prison). 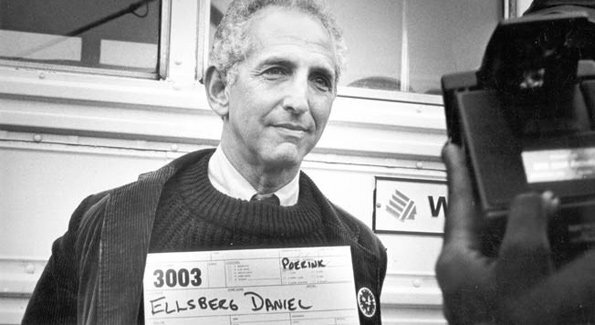 The Most Dangerous Man in America: Daniel Ellsberg and the Pentagon Papers is guilty of occasional missteps, but nonetheless, it is still a riveting, exciting documentary film. "The Most Dangerous Man in America: Daniel Ellsberg and the Pentagon Papers" is available today on DVD. For A/V and bonus information, read this review on DVD Talk.